I find it a little odd that Sub Pop is giving Bunny Gets Paid the deluxe reissue treatment. 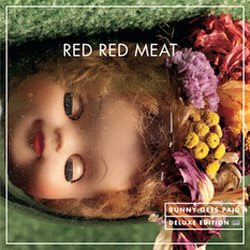 Red Red Meat were a great band, but this album is hardly a starting point. I would recommend both its predecessors: 1994's Jimmywine Majestic and 1997's There's a Star Above the Manger Tonight. You need these before being steered toward Bunny Gets Paid. This is still a good excuse to hype the band, who are a relatively unknown jewel in the Sub Pop catalog. Jimmywine Majestic is a lost classic of wonderful, Stones-influenced, ragged rock 'n' roll. Meanwhile, There's a Star Above the Manger Tonight, is wholly satisfying for it's experimentation and risk taking, offering a glimpse of what was to come when band members went on to form Califone. Check out this mp3 above and then search out one of the aforementioned records. Sub Pop still gets the money no matter which of these records you buy... Make the right choice.